'Fellaheen Boy on Buffalo', 1882. Young boy with a dog, c 1930s. Young boy picking a daffodil, c 1930s. 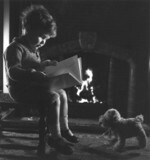 Small boy reading a book by a fireside, c 1930s. Father Christmas and page boys, 1933. Two boys playing with a Meccano set, c 1930s. A small boy feeding a dog, 1932. Boys fighting in the streets, 10 July 1931.